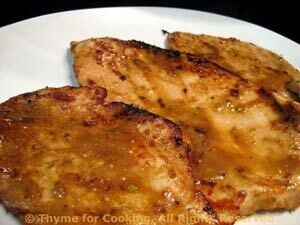 Garlic-y Turkey Cutlets Aioli, quick, easy recipe from the Barbecue. Pour over turkey and let marinate for 15 minutes - or longer if you are doing other stuff, up to 45 minutes. Remove turkey from marinade and cook on barbecue 4 - 8 minutes turning once or under broiler for 12 - 15 minutes turning once - or sauté in large skillet 10 - 15 minutes (you get the picture). Baste with any remaining sauce. In all cases it depends on thickness and test for doneness by slicing and peaking. Serve. Note: Nutrition info assumes 50% of marinade is eaten.